Today I want to show you a velveteen or velour t-shirt type dress with a feminine touch. I love these effortless dresses that are warm and so comfortable to wear. And an easy make on top of that! Lay your fabric double, take a shirt and lay it over - double. Cut around it, make it as long as you desire. Do the same front and back. Sleeves: lay the t-shirt sleeve over, cut around it, but make the top part taller than the shirt sleeve - look at picture three above. Lay your front and your back pieces on the fabric, cut along the edge, remove the piece and cut out pieces one inch wide - pictures above. Sew shoulder seams of the dress and the neck lining. Put the neck lining inside the dress, right sides together. Sew around the neck. Flip the neck lining over to the wrong side of the fabrid, sew two seams around the neck. Sleeves: Take one piece of elastic, place it in the middle of the sleeve on the top - sew, while you're pulling on the elastic. It will look like the above pictures - front and back. Fasten the sleeve to the dress. 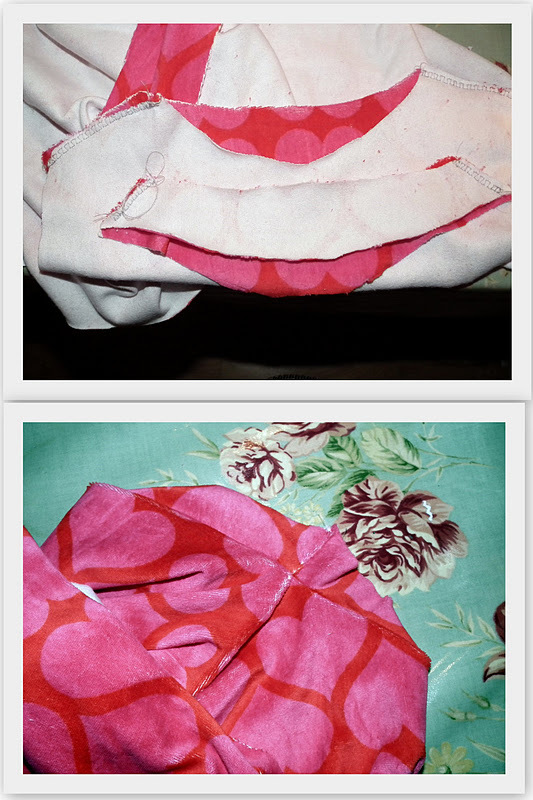 Make pleats with pins as shown above, to make the sleeve and the dress sleeve hole fit together. The sleeve is a little narrow at the bottom, so hem, then sew the seam from the end of the sleeve to the bottom of the dress.